Electronic Quills centers on the words and experiences of teachers and students who used QUILL — a software package developed by the authors to aid in the teaching and learning of writing. It looks in detail at the stories of these early users and considers questions relevant for other teachers, students, researchers, and developers of educational innovations. Citation: Bruce, B. C., & Rubin, A. D. (1993). 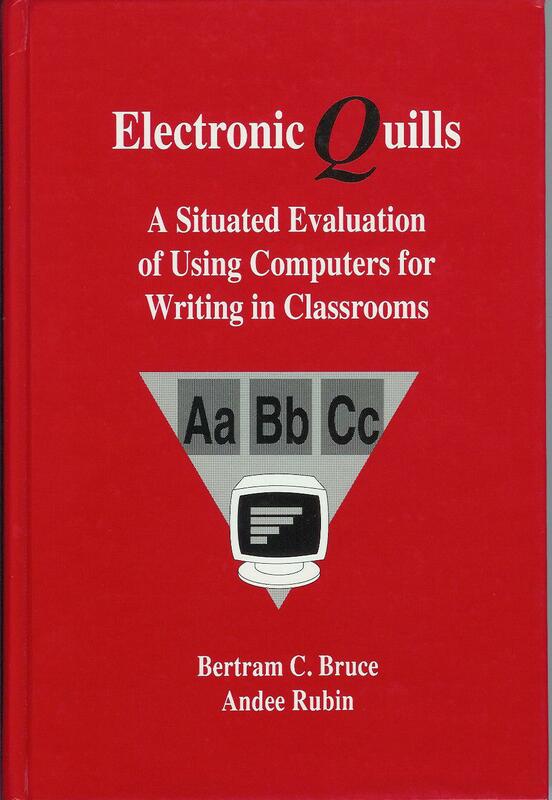 Electronic Quills: A situated evaluation of using computers for writing in classrooms. Hillsdale, NJ: Lawrence Erlbaum. What does it mean to develop an environment for literacy in an actual classroom? How can a teacher create an environment in which students work together toward meaningful goals? How can a teacher promote the rich communication so necessary for developing language? What is the role of technology in the practice and development of literacy? The examination of the QUILL experiences provides a fuller and more revealing account of what it meant to use QUILL than would have been possible through standard evaluation techniques. At the same time, the focus on the particulars also finds analogues in analyses of similar pieces of open-ended software or educational innovations in general. Rubin, A., & Bruce, B. (1990). Alternate realizations of purpose in computer-supported writing. Theory into Practice, 29, 256-263.